A finished sweater, just in time for spring? We returned home this week to sleet, snow, and freezing rain, but at least I finished this hoodie (in Cascade Superwash Paints) to keep my son warm. I’m so happy this improvised sweater turned out! I used this henley pattern from Knitting Pure and Simple, slightly changed the neckline to include a single button loop, replaced the ribbed cuffs with seed stitch and added a hood. My son frolicked around in all that icky snow, but I’m definitely ready for the spring promised by the calender today. I hope the first day of spring finds you enjoying crocuses rather than slush! 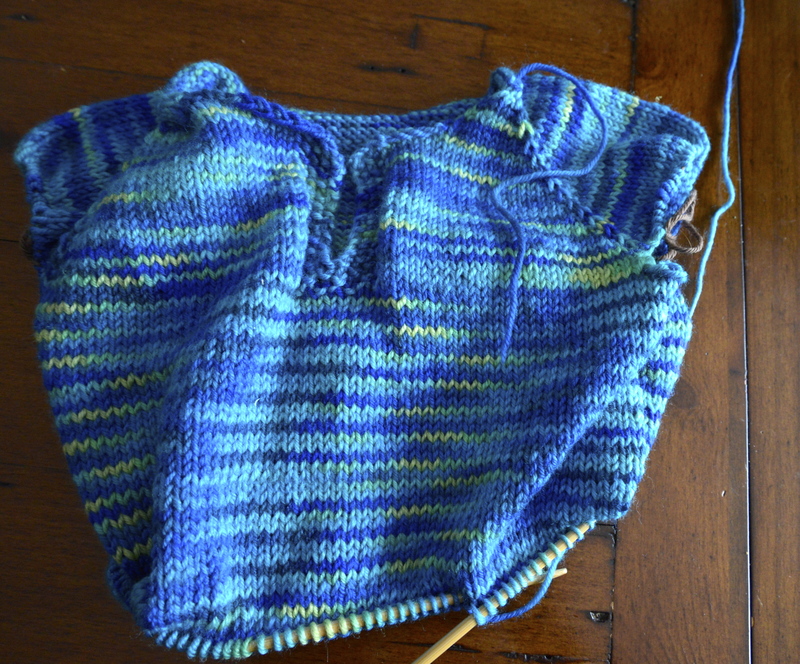 This entry was posted in Knitting, Sweaters, Toddler knits and tagged Cascade Superwash Paints, first day of spring, hoodie, knit, sweater, toddler on March 21, 2013 by lisagono. Sometimes a single pattern just won’t do. 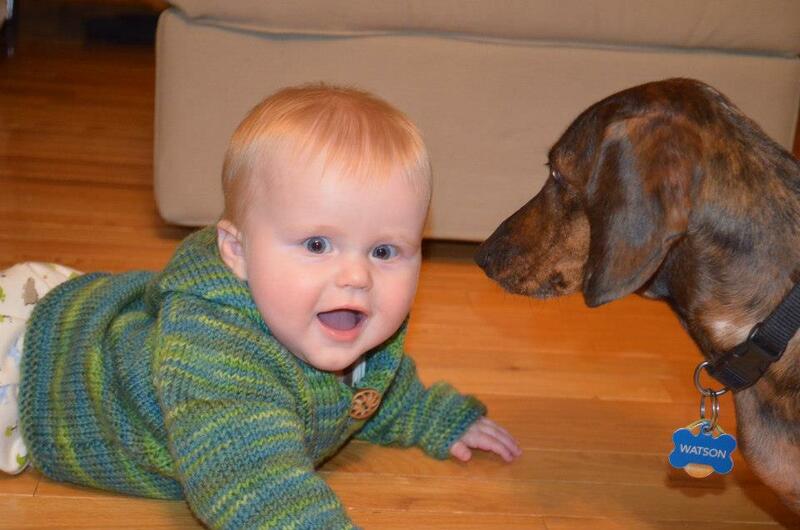 In this case, I loved the casual ease of the hoodie that I made last year for my niece and nephew. 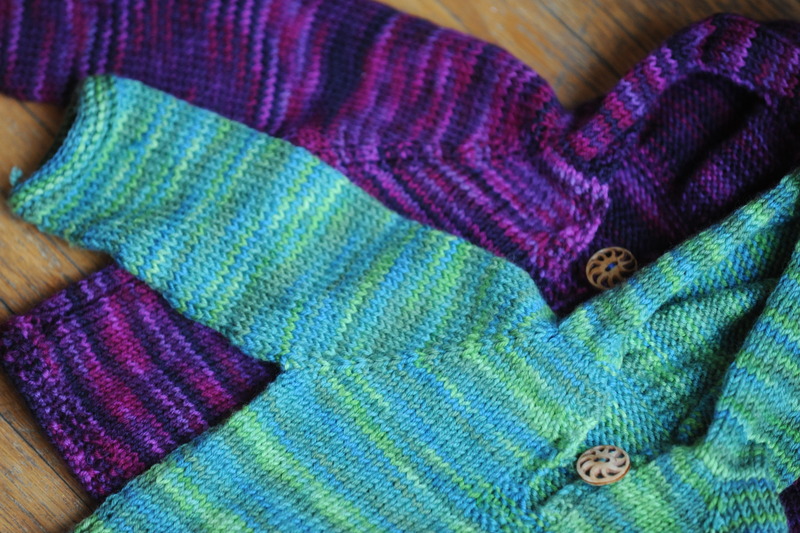 It looks great in the vibrant Cascade Superwash Paints, and both sweaters have gotten a lot of wear. I wanted to make one for my son in the gorgeous blue colourway I spotted on my last trip to the LYS. 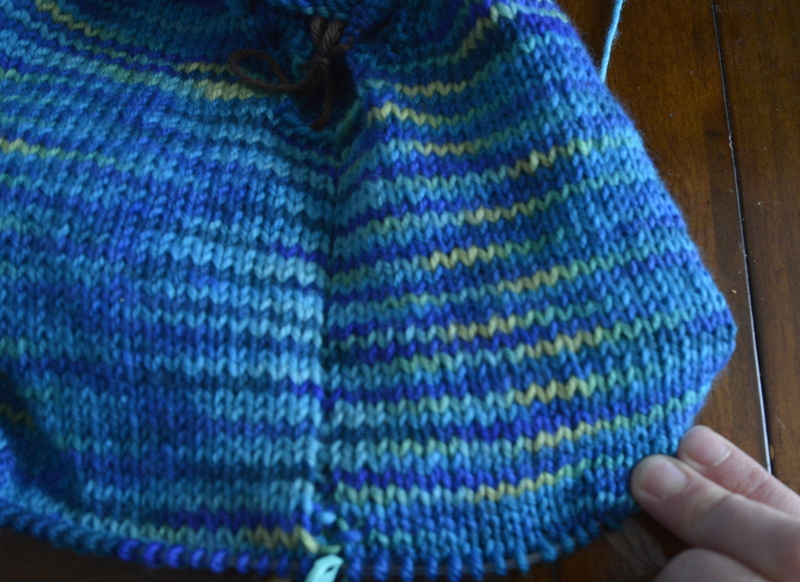 Unfortunately, it was a class pattern from my LYS, without much in the way of sizing variation. I could have sat down and done the math to size this pattern up, but to be honest, sizing and fit are my weaknesses. I’m really picky about how sweaters fit, but I cannot often muster the patience to rewrite every line of a pattern to fit the exact proportions of the recipient. In fact, it’s the reason I rarely make sweaters for myself. To make matters worse the original pattern just recommended different needle sizes and gauges for different sweater sizes. 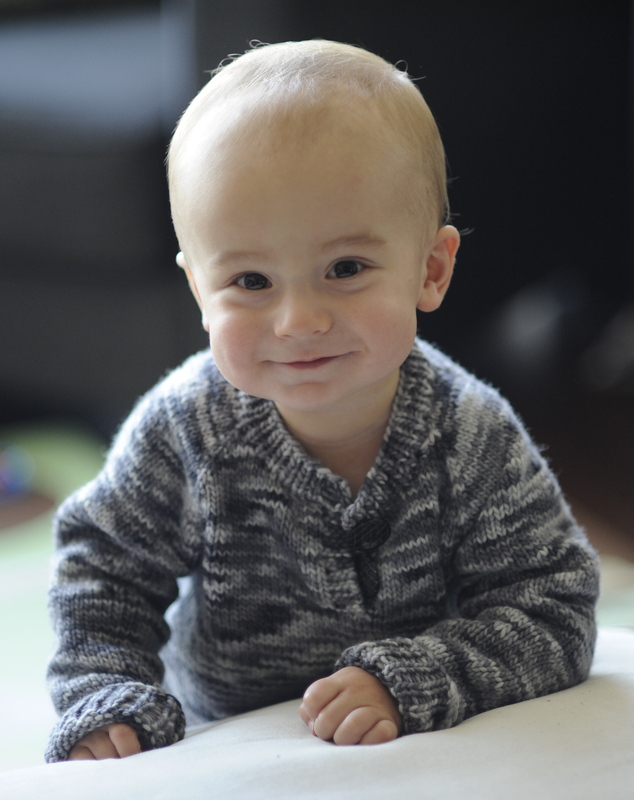 Fortunately, I already had this Knitting Pure & Simple henley pattern. When I made the size 2 henley over a year ago, I was really impressed with the proportions, which were perfect for my slim little guy. All of their kid’s patterns contain detailed instructions for sizes from toddler to preteen. I love this pattern but I find it a little fussy for everyday preschool wear (especially since my son’s favourite outfits consist of t-shirts and sweatpants). The solution was clear: fraken-pattern! I used the sizing, gauge and stitch counts from the henley (this time in size 4), and the trims and details from the hoodie, with a few of my own touches added in there too. The cuffs. The henley pattern called for ribbed sleeve and waist cuffs, knit on smaller needles. Instead I didn’t change needles and replaced the cuffs with a seed stitch border that sits flat, giving the sweater a more casual silhouette. The neckline. I have never ever closed the neckline on a henley sweater or t-shirt, so I used the open neck with a 3 stitch wide seed stitch border from the hoodie pattern. At the end, I’ll add a little i-chord and a single button, so that the neck can, on rare occasions, be pulled in tight against the wind. The faux seams. In Ann Budd’s excellent Top-Down Sweaters, she suggests adding a faux seam in top-down sweaters from the underarm to the waist. They can be accomplished by purling or slipping a stitch under the arm, every second row. This is my favourite knitting tip ever, it’s so easy and all seamless sweaters hang so much better with this little modification. The hood. The henley pattern calls for a ribbed collar; here I will just substitute in the hood instructions from the other pattern. This entry was posted in Knitting, Sweaters, Toddler knits and tagged Cascade Superwash Paints, knit, knitting, raglan, sweater, toddler on March 7, 2013 by lisagono. 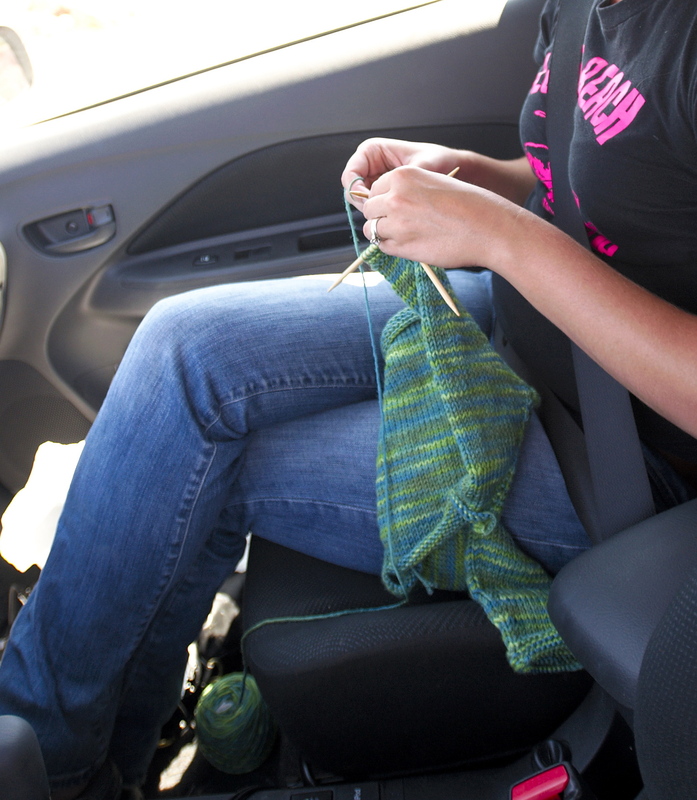 Knitting in the car has transformed road trips for me. The meditative nature of the repetitive motion and the feeling of productivity quiet my busy mind, and lets me appreciate the scenery, the radio and the lazy conversations. Making this raglan hoodie for my nephew (in Cascade Superwash Paints), kept me occupied for the entirety of our most recent road trip, from Las Vegas to Santa Fe, loosely following the route of the mostly demolished Route 66. It was the perfect road trip and the perfect road project: requiring just two skeins, two sets of needles (circular and DPNs) and knit in one smallish piece, that fit easily in my hands and my luggage. I started and finished this sweater, while watching the surreal, constantly changing scenery of the American Southwest. Driving in Nevada, Arizona and New Mexico really should be on everyone’s bucket list. We started our Southwest road trip with a single night at the Tropicana in Las Vegas. I was prepared to hate Vegas, but I found myself completely seduced by the tacky fun of it all. The crazy buildings, the big hotel rooms and bigger portions, the novelty cocktails and of course, the Cirque de Soleil are all really fun in moderation. It’s hard not to love Las Vegas, just a little. It wasn’t until we had water up to our knees the next morning in Las Vegas, that we discovered that August is monsoon season in the dry Southwest. Undeterred, we hit the REI and Whole Foods for camping supplies, and hit the road. Our next stop was the Grand Canyon. 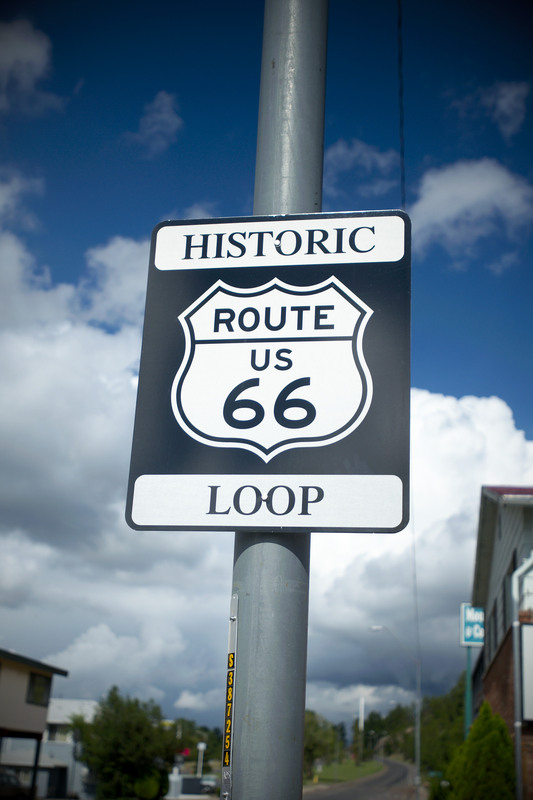 Along the way, we spotted the Hoover Dam and all of the kitsch that the Route 66 had to offer, with concrete wigwam hotels, and neon lights advertising cowboy steaks. I wish we had allowed ourselves more time; our compressed 8 day itinerary didn’t leave a lot of room, and we didn’t give the Canyon or the gorgeous alpine towns nearby nearly enough time. We did hike the rim of the canyon, and camp nearby. I was astounded by how easy and cheap it is to find camping accommodation in the Southwest, anyone contemplating a road trip should have a tent stowed in their luggage. We had planned and spontaneous camping nights along the way, and they were fantastic – beautiful surroundings, quiet nights and clean, warm showers dotted our entire route. 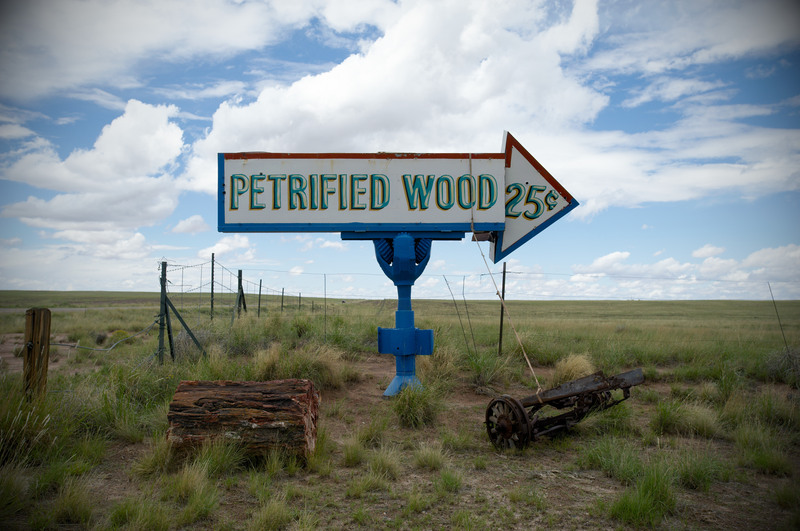 After the Grand Canyon, we caught one of Route 66’s famed attractions: the Petrified Forest. 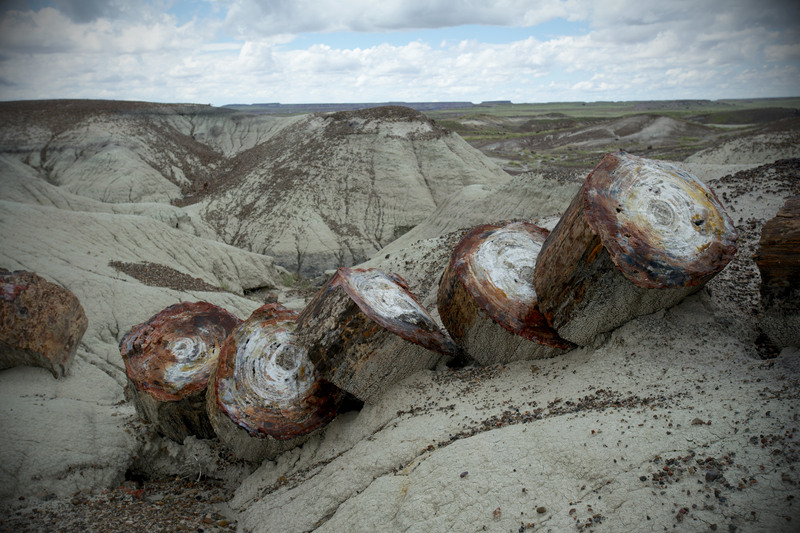 The Petrified Forest and Painted Desert are well worth a stop. The million year old trees, and blood red desert landscapes really need to be seen to be believed. We simply turned off the Interstate, wandered the paths (which are all reasonably short) and had a picnic lunch overlooking the Painted Desert. When we crossed into New Mexico we lost an hour. (In the summer, Arizona doesn’t spring forward, so the time shift happens at the New Mexico border. If you are travelling in the winter, the time changes at the Arizona/Nevada border). The lost hour and the way too ambitious itinerary meant finding spontaneous accommodation in Gallup, New Mexico. Here, our Lonely Planet came through for us, and we camped in the shadow of the stunning cathedral rock, for $10! This campsite and the best tacos I have ever had (in Espanola, NM) were well worth the price of our Lonely Planet. 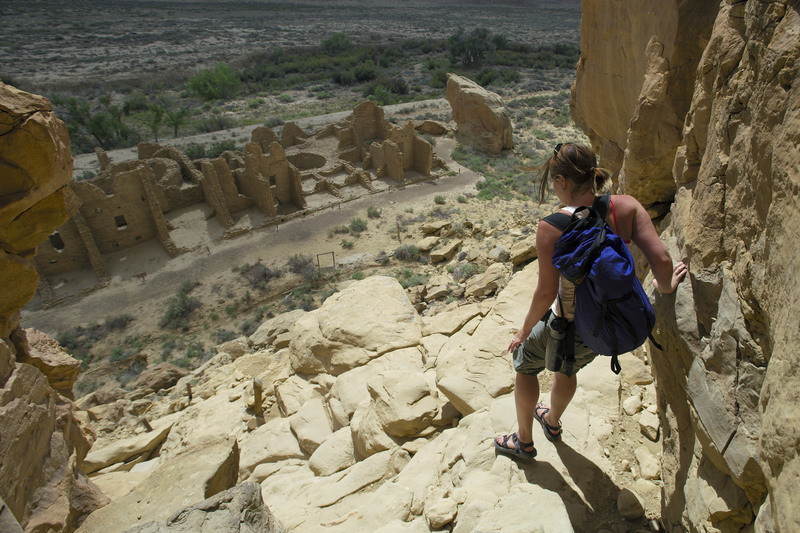 Our next stop was Chaco Culture National Park. Surrounded by many kilometers of dirt road, it’s easy to see why many tourists miss this park, but it was the highlight of the trip for me. 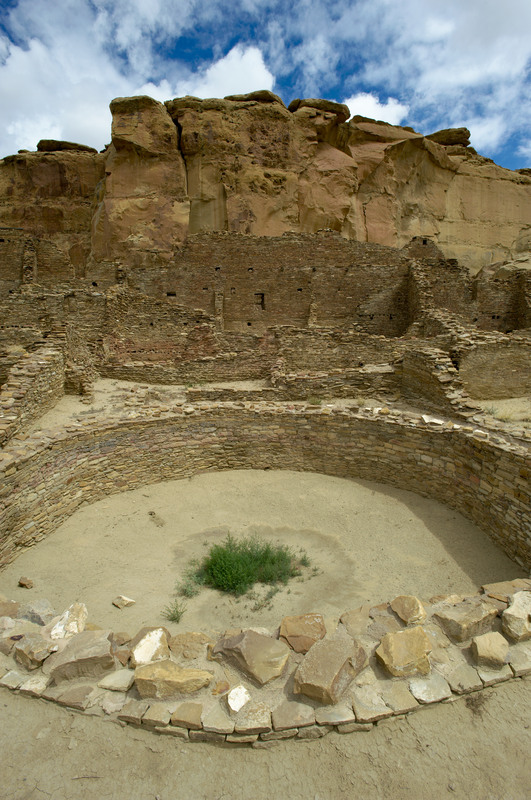 Nearly a thousand years ago, the Chaco people built huge great houses in the canyon, the ruins of which are easily accessible by the ring road that runs through the park. 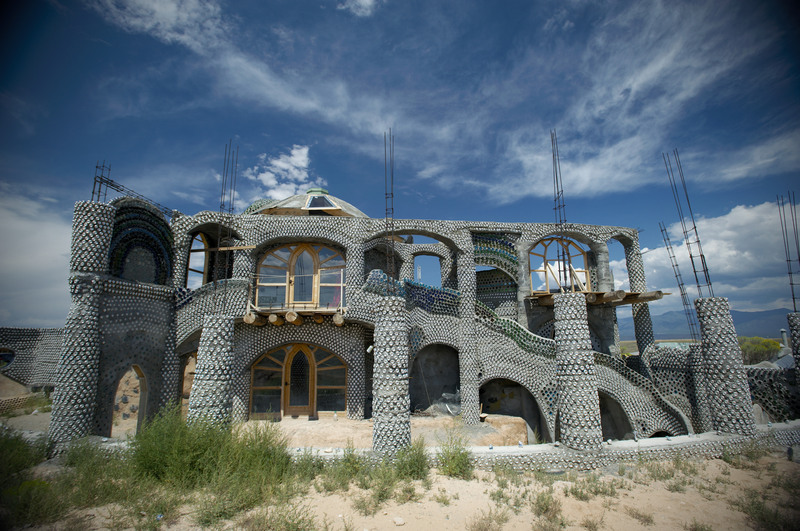 The reason(s) that huge houses were abandoned (well before Europeans arrived in New Mexico) remains a mystery. 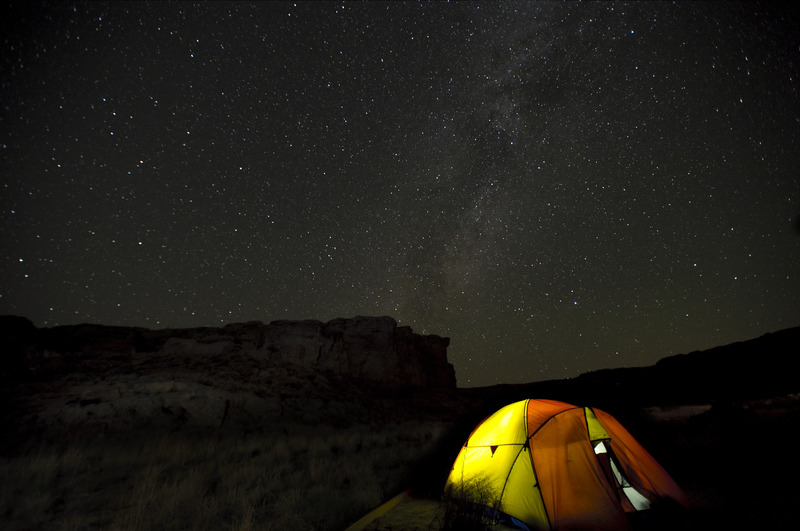 While some travelers arrive in the park for the day, I strongly recommend camping. I have never seen stars like the ones we saw from our tent that night, and travelling across the dirt roads does not leave a lot of time for hiking if you only come in during the day. The scramble up the canyon walls to see the ruins from above is well worth the effort. 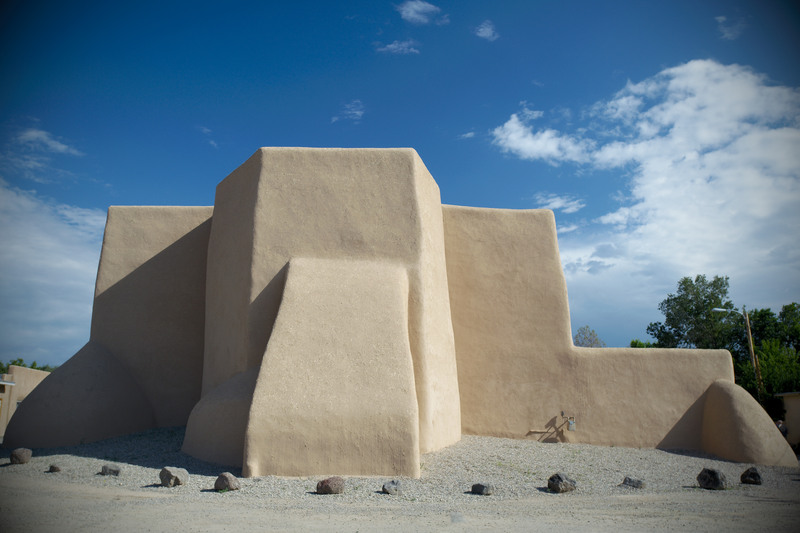 After Chaco, we travelled to Taos. The Pueblo there had been the major draw, but when we arrived, we discovered that it was closed to visitors for the duration of our stay. I gather this is a relatively frequent, and poorly publicized occurrence, but Taos is worth a visit either way. The gorgeous San Francisco de Asis Mission Church there was photographed by Ansel Adams and painted by Georgia O Keefe. The accommodations and restaurants are fantastic (especially the Love Apple, which served me the best meal I ate in 2012). The shopping is a thrill, the Navajo are world renowned for their textiles and jewelry, and I picked up a rug and turquoise bracelet there that I count as among the most beautiful things in our home. A visit to the Georgia O’Keefe museum and the delicious Cowgirl Hall of Fame in Santa Fe rounded out our trip. My only regret is that we didn’t have the time to see more that the Southwest has to offer. Fortunately, there will always be more opportunities for road trips, and road knitting. This entry was posted in Knitting, Sweaters, Toddler knits, Travel and tagged Arizona, camping, Cascade Superwash Paints, Chaco Culture, knitting, Nevada, New Mexico, road knitting, road trip, Route 66, sweater, travel on February 6, 2013 by lisagono. I love to wear capri leggings to spinning and yoga, but I also live in Canada, so slim fitting tall legwarmers were definitely needed to get to the studio and back. Legwarmers should fit snugly around ankles and knees, but also stretch easily over the rest of the leg. I chose textures that would hug close to the ankle, but also stretch to accomodate cycler’s calves. The combined 2 by 2 ribbing and traditional pleated fisherman’s sweater pattern resulted in really stretchy, very easy legwarmers. As a result, size and gauge should not be major concerns. This pattern is now available for sale at my ravelry store. This entry was posted in Knitting and tagged beginner pattern, Cascade Superwash Paints, fisherman, knitting, legwarmers, pattern, yoga on January 26, 2013 by lisagono. Now that I am finally done my holiday gifts, my mind has turned to the new year and new projects. As I set my intentions for 2013, one word came to mind: flexibility. Physical flexibility to help my tattered knees through a new year of travel and adventure, but much more importantly mental and emotional flexibility to help me become a better parent, spouse, friend and family member. This year, we hope to take our son on his first major trip (possibly to Iceland?) and I have a feeling that crossing the Atlantic (or part of it) with a toddler will tax my exisiting flexibility. One of the traits I most admire in my husband, is his ability to abandon the long list of to dos and be in the moment with our son. Maintaining a household with two working parents and one tiny person requires a lot of scheduling and managing, but in 2013, I resolve not to let the schedules and tasks prevent me from being present. I resolve to let the little things slide, so that I have the energy and strength to do what’s most important. Basically, I resolve to be more flexible. I’ve taken this resolution to the yoga mat with me a lot this week, and that’s inspired my first project of 2013: leg warmers to make the trudge through the snow to the studio a little easier. Legwarmers require minimal shaping, so they’re a great place to play with texture. My parents bought me Cables, Diamonds and Herringbone for Christmas, and I’m experimenting with the lovely fisherman’s sweater textures to make my legwarmers in Cascade Superwash paints. I can’t wait to get these finished and on my legs. When I do, I’ll share pictures, and the pattern. This entry was posted in Knitting and tagged Cascade Superwash Paints, flexibility, knit, legwarmers, New Year's resolutions, yoga on January 3, 2013 by lisagono.